The father woke up, he was holding the Green Man in his arms. He was telling the Green Man I know we do not have the same father but we are brothers. And dear brother like my son you have become part of me. You told Grunewald and Soutine not to be afraid of distortion. Sit in this chair cross your legs and perpetuate your foliage, Green is an ancient color. TheGreen Man takes off his Green hat and his Green hair falls onto his Green shoulders, he smiles and I ask myself, "Do we have our own Green Man a space that isn't me." 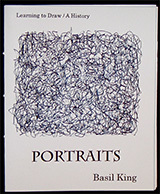 King’s writing is deeply knowing—both in the sense of art historical knowledge and of the wisdom of a painter who has had a life-long love affair with art—and deeply felt, personal, intelligent, and at times painfully. A wonderful book. It is natural and straightforward in form and supernaturally brilliant in content. The voice is just right throughout. Thank you for getting it all down. King doesn’t just see everything (in his field of vision) but he wants to see everything. Surely what King has accomplished in this book (as well as his other accomplishments as both writer and a visual artist) would not have been possible without such an immense desire. …King takes us along to examine how widely variant strains of data reverberate and pummel, as Lana Turner weeping, out of control, hurtling through a colossal rainstorm in Beverly Hills, crashes through the formal jigsaw of Vincente Minnelli’s The Bad and the Beautiful and wakes us to life. In his essay on why the miniature is as important as the mural King insists that light abstracts the smallest thing. …The impact is cumulative and thoughtful, allowing a larger picture and frame of reference to emerge and yet still allowing for the smallest of details to have impact. This artist’s word ‘perspective’ is what King brings to his vivid, hybrid writing. It is the perspective of someone who has been trained not just to look but to SEE, and not miss anything in his field of vision. 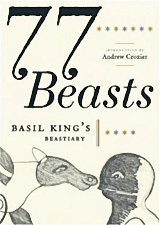 Full of jump cuts and precise depiction, King’s work here always yields what his old now departed friend Amiri Baraka called emotional validity. 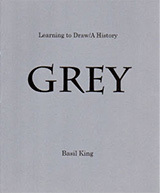 Its rich detail doesn’t stale on rereading but underlines King’s skill as a writer in matching technique to what he has to convey, or with local detail dovetailing connections between one painter and another. It’s a book too immediately attractive to deserve having its strength and subtleties explained in advance. What enchanted me was the fact that the work was such a free-flowing & compendious meditation on aesthetics & history, moving as the mind does, from Stieglitz to Leonardo to Pound to Black Mountain to Kline to Lindbergh to Breughel to Whitman to Gertrude Stein to Walker Evans and so on. —Colin Still, filmmaker and principal of Optic Nerve. 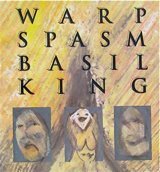 As a long poem, Basil King’s Mirage never flags… [He] recounts amazing stories contained in prose passages that break into the poetry like bedrock beneath a mountain stream. 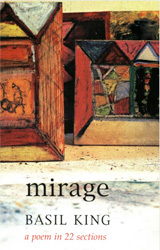 The title, Mirage, perhaps refers to the elusiveness of truth as time overwhelms our personal and public histories. 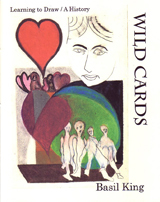 Any reader with an interest in recent American literature and painting will be especially enamored with this work. Essential symmetry of experience which has gone against both the metronome and arrhythmia and beyond the ornamentation of inessentials in so much present writing. It helps to have had one’s hands covered with paint. Someone, after a long life, is standing at the door of some facet of wisdom. I’m awed by the simplicity and strength. 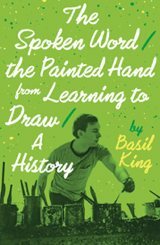 [Basil King] does write like a painter, not simply with colors, but strong strokes here and refrains of blue there. 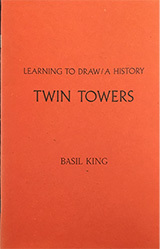 How to describe Basil King’s life’s work? Poetry? Fiction? History? Autobiography? 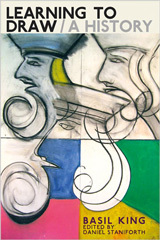 And what of the intersections with his fascinating drawings? 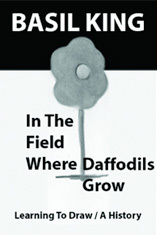 Warp Spasm continues this unprejudiced investigation — a weave of signs in a field, ever flexing to accommodate observations drawn from many times, voices & lives variously lived. In an era of rabid imperialism & cultural banality, this is the work of a man whose appetite for the fabulous life of the arts remains ablaze. —Michael Hrebeniak, editor Radical Poetics, U.K.